The popular restaurant at Bromsgrove Golf Centre now has a new name and some new treats on the menu – but diners can still look forward to the same friendly service in attractive surroundings. Now called Edwards – named after the club’s founder and president Ted Morris – the restaurant and bar have been rebranded with new menus, signage and smart staff uniforms. Edwards is open every day, and you don’t have to be a member of the golf club to enjoy a meal or a drink here; everyone is welcome. Large groups can usually be accommodated, making the venue popular for family get-togethers and group outings. Whether you’re visiting for breakfast, lunch, afternoon tea or dinner, you’re sure to find something tempting on the comprehensive menu, which is frequently refreshed to reflect the changing seasons. All meals are cooked to order, with locally-sourced produce used wherever possible. The main menu is served from 8am to 9pm Monday to Friday and 7am to 9pm on Saturdays, plus Sunday breakfast from 7am until noon. Traditional Sunday lunch is available from noon to 7pm (summer) or 5pm (winter), when diners can select from a three-course menu for £12.95 per adult (£9.95 per child) or choose from the daily Specials Board. There’s also a monthly set price evening menu, available from 5–9pm Monday to Saturday, offering two courses for £11 or three for £13. The bar, meanwhile, is a great place to relax after a round of golf, enjoy pre-dinner drinks, meet up with friends or watch the action on Sky Sports. 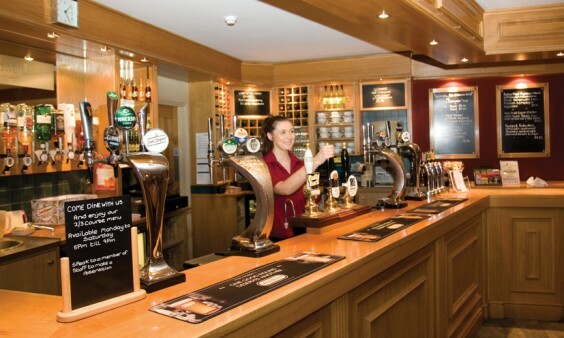 There’s always a choice of real ales, including Bromsgrove Golf Centre English Ale, brewed especially for the club. If you’re planning a private celebration, remember that the club’s function suite is available to hire for birthdays, weddings, funerals and everything in between. Bromsgrove Golf Centre can also offer excellent conferencing facilities for up to 70 delegates. There is free wi-fi throughout the centre as well as excellent parking.